KConfig variant using shared memory. 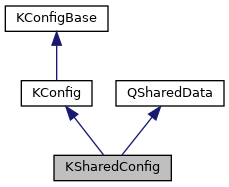 KSharedConfig provides a shared (reference counted) variant of KConfig. This allows you to use manipulate the same configuration files from different places in your code without worrying about accidentally overwriting changes. The openConfig() method is threadsafe: every thread gets a separate repository of shared KConfig objects. This means, however, that you'll be responsible for synchronizing the instances of KConfig for the same filename between threads, using reparseConfiguration after a manual change notification, just like you have to do between processes. Definition at line 44 of file ksharedconfig.h. Creates a KSharedConfig object to manipulate a configuration file. If an absolute path is specified for fileName, that file will be used as the store for the configuration settings. If a non-absolute path is provided, the file will be looked for in the standard directory specified by type. If no path is provided, a default configuration file will be used based on the name of the main application component. mode determines whether the user or global settings will be allowed to influence the values returned by this object. See KConfig::OpenFlags for more details. Definition at line 76 of file ksharedconfig.cpp.